Most of my time was spent on trying to think up of something to keep her off the iPad or making her use the internet for some useful things. This dress is also a result of that. The end-of-summer sales is going on in most places and I came across the Lana Gross Basics mercerized cotton yarn being sold for 1 Euro each. Well, I could not let go and grabbed a few. My plan was to make a dress - a very simple dress. Here cropped up the next problem - and this is one which most mothers with daughters will identify with - of late, my daughter does not like most of my choices. And if I crocheted a dress without checking with her, I was absolutely sure she'll most probably relegate it to the deep dark corners of her wardrobe. So, I gave her the responsibility to search for a dress pattern she liked. After quite a bit of search , when she showed me the style she wanted , I almost had a fit !! A boat neck bodice with a fitted waist and a flaired skirt - and this was going to be my first time making a dress..sigh!! 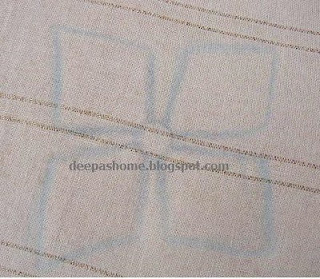 This is the pattern she picked out. After a lot of trials, I managed the top part in my own way and thankfully she was happy with it. A friend in one of the Facebook groups helped me a lot with her suggestions. With the yarn I had, I made four panels for the skirt . The last panel was a torture - it never seemed to end. 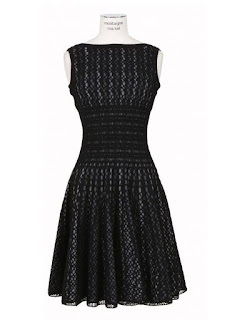 I now know why most crochet dresses are A line. In fact, I wanted to make totally five panels, but I ran out of the pink yarn - I used up 12 * 50 gms of pink yarn and one 50 gm of the purple. Wow! That is a lovely summer's gift from Mum to daughter. It must have taken forever to crochet the skirt! It may have been a challenge, but it turned into a great success! 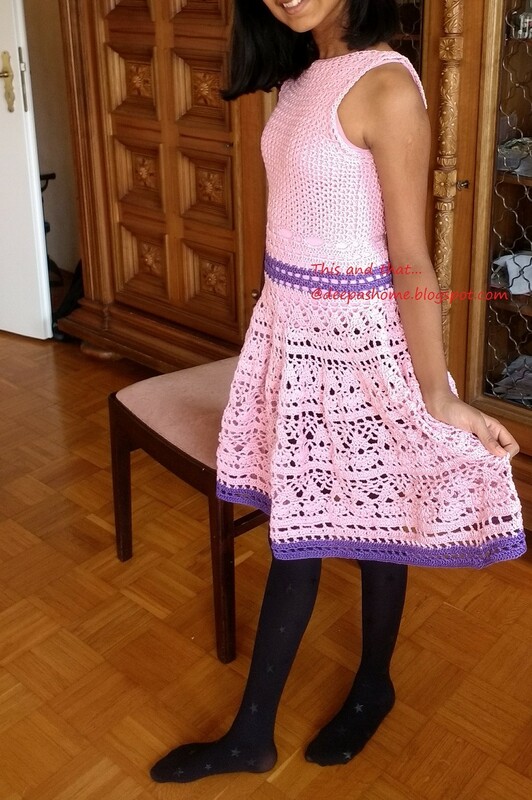 such a great crochet project you have made here the dress looks so lovely on your daughter I am not at all surprised she wants you to make more. Lovely dress!! And your daughter looks very much pleased too:) I always make something for my daughter after checking with her, my choices are totally different than hers. But still, we try to arrive at near common likes. Good luck with the next dress. The dress looks gorgeous! You did a wonderful job designing your version of the dress in the photo, and I'm so glad it met with your daughter's approval. Wow! What an amazing dress - both the inspirational one and your interpretation. Your daughter has to be thrilled - and obviously is if she's asked you to make another one. Good job!